This is Melissa with Moe Creations! 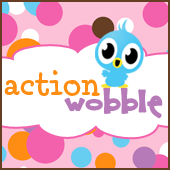 Wow, busy week for me, now things are finally starting to calm down, just in time too, I wanted to have enough time to do this quick Action Wobble post for you today.I found this little chicken over at the silhouette store, it's a PNC! The funniest part is that you have a front and back image of it, which gives you lots of possibilities! OK words can not describe how much I am sitting here laughing right now! Thanks for sharing. Way fun! Love that chicken! Life's better in Flip Flops!